A parable is a short story of fiction that illustrates a moral. Jesus told parables to instruct his followers. The parables of Jesus, found in the gospels, embody much of Jesus’ teaching. Jesus’ parables are quite simple, memorable stories, often with humble imagery, each with a single message. Jesus’ parables were often surprising. The Parable of the Good Samaritan, for example, turned expectations on their head with the despised Samaritan proving to be the wounded man’s neighbor. The parables were simple and memorable enough to survive in an oral tradition before being written down years after Jesus’ death. 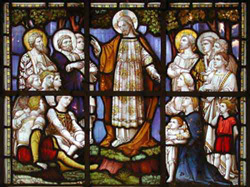 On the menu are the eleven parables pictured on the church’s stained glass windows.